We have to change the way we travel. The impact of mass tourism is enormous: pollution, trash, weakening and destruction of of ecosystems, and so on… When people are on holiday, they want to relax and often don’t care about the environment. On the other side, the tourism industry encourages people to consume a lot: the result is tons of plastics in the nature. Tourism will always have an impact, but we can reduce it by being more responsible and respectful of the places we visit! Nature deserves our respect. As a teacher, I care about education. Children are the adults of tomorrow. It’s a duty to educate our kids to the environmental issues because they will have to face the problems we created. Change for a better future and planet is in their hand! At school, alongside my job as a teacher, I have created Eco-school workshops with the aim to better manage waste and raise awareness in the whole community. This year I went back to University to study sustainable development. Moreover, my job gives me the possibility to take a year off. It is a unique occasion to travel around the world and see it with a new eye! 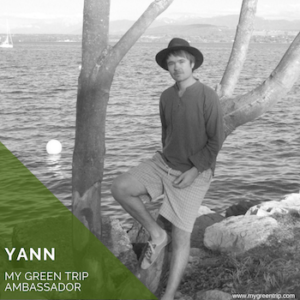 I wanted to combine travelling with doing something positive for the planet, and I think being an MGT Ambassador is the right way to do that!